So here’s hoping today is the day we leave the shipyard. Emotions and stress levels have been running high all week, with morale a little bit on the low side so we’re all up early this morning with all hands on deck, literally. To prepare the crew for what will undoubtedly be a long day ahead I’ve made these mini breakfast muffins. They’ve got all sorts of goodness is them; bananas, oats, apricots, almonds, etc so they’re low GI which means they will keep us fuller for longer and give us a nice, healthy energy boost to start off the day. The recipe is quite a large batch for baking at home so you can either halve the recipe or you can make a nice, big batch and freeze some. These would be great for kid’s breakfasts because you could get one out of the freezer the night before and they’d be good to go by morning, you could even heat them up in the microwave for just a few second to give them that “fresh out of the oven” aroma. Ok, guys fingers crossed… wish us luck! Pre-heat the oven to 190C . In a large mixing bowl mash up the bananas with a potato masher to get a nice smoothish texture. Add the honey, vanilla, cinnamon, eggs, oil, bicarb soda, salt and natural yoghurt and mix well. Now add the almonds, oats, apricots then mix these into the batter. Carefully add the flour, taking care not to over-mix the batter. The batter should be quite wet and loose. 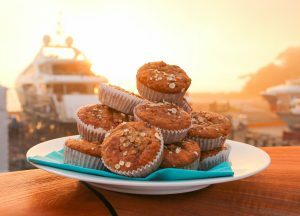 Line a muffin tray with some muffin or cupcake cases, half fill each case then top with a sprinkle of oats. Bake for around 20minutes depending on the size of your muffins (mine were quite small) and then when they are done take them out of the oven and allow to cool on a wire tray. Drizzle a tiny bit of maple syrup over each one and you’re good to go!